This past Wednesday, friends and family of Andy Garcia, killed in a brutal hit-and-run last month, came face to face with the woman that had upended their lives. “It was very hard and emotional being there and seeing the person who killed my friend Andy,” wrote Mario Lopez to me yesterday. 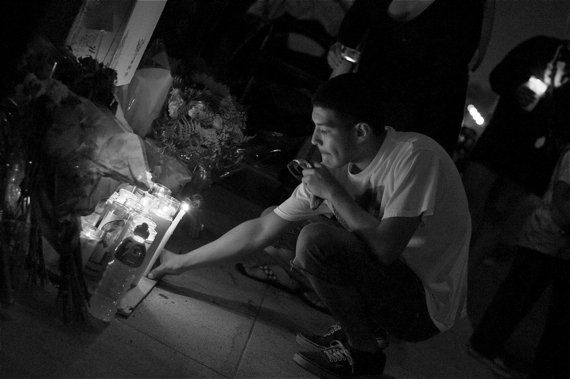 Lopez was one of the riders 21 year-old Wendy Villegas had mowed down that fateful night. It was also physically draining for him. He is still recovering from fractures in his back and leg. While he is able to stand and walk around for short periods without his walker, he is still in a brace and in a lot of pain. So, when she and her lawyer complained that wearing an ankle bracelet that would monitor both alcohol intake and movement would be inconvenient to a young, working student as well as a challenge for her to pair it properly with the variety of shoes she wears, Lopez couldn’t take it any more. Indeed she had, and then some. On the night of Sept. 14th, she had come tearing up the bridge on Cesar Chavez, knocking cyclists out of the way like bowling pins. Lopez was tossed into the air, Garcia was slammed to the ground and his bike was dragged several hundred feet under her car, and Ule Melgar was nearly knocked over the railing and into the river below. She was still intoxicated when she was taken into custody several hours later. Thankfully, say both Lopez and Melgar, the judge recognized the seriousness of what had happened and had little sympathy for her. According to them, the judge told Villegas she will wear the device because she is a danger to society. As such, she is no longer able to drive a vehicle, must obey a curfew, and is obligated to appear in court by 4 p.m. today (Oct. 11) to both pay for the monitor and have it placed around her ankle. Should she choose not to do so, the judge advised, a warrant would be issued for her arrest, she would be placed in custody, and her bail would be revoked. It isn’t too surprising that she would be already protesting at an arraignment. The charges against her are quite serious: one count of vehicular manslaughter, a DUI, and a felony hit-and-run. Because she had injured so many people, she is looking at a minimum sentence of 5 – 7 years and a maximum of 10 – 15. While that means that some justice will likely be served, for the young men who witnessed the incident and/or were injured, their lives have been forever changed. Lopez wrote that the arraignment was the first time he and the other riders finally talked about what happened that night. His friends, he says, are struggling with having lost a friend to something so senseless as well as with having seen it unfold right before their eyes. Having been seriously injured, Lopez actually hadn’t witnessed the carnage firsthand. When he finally heard the details, he wrote, he was left feeling nauseous and even less able to sleep than before. Lopez himself has lost work since the incident and is in constant discomfort because of his injuries. The fact that he can’t do much on his own has left him feeling helpless and dealing with waves of anxiety. He is also frustrated with the fact that things are moving slowly. While his injuries prevent him from needing his bike back from the LAPD (who are holding the men’s bicycles for evidence), Melgar is a bike commuter and would benefit from having his bike back. The next hearing isn’t until November, and it isn’t clear if they will get them back then, either. As for Melgar, he is still experiencing pain from that night, as well. He had landed on his back after being thrown like a rag doll, but his fall had been broken by his backpack. He was left with very ugly road rash, but his back was intact. But lately, he told me, he has been experiencing some pain in one of his legs. If you’d like to donate to Andy’s memorial fund to help his family — who live out-of-state — pay for funeral costs, please make checks payable to the Luis Andres Garcia Donation Fund, Acct# 5566986583, at any Wells Fargo Bank. To keep up with information on Andy’s case, please check in here. Friends of Andy will be holding a party and car/bike-wash this Saturday, October 12th, beginning at noon at Manny’s Car Wash, 4635 Valley Blvd., in East L.A. They’ve got several bands and DJs lined up as well as food and craft beer. They thank all those that have contributed so far. I know it’s not much, but Ule Melgaris welcome to have a brand new free 6ku single speed bike courtesy of Wolfpack Hustle / Aventon bikes. Contact me if this at all helps. roadblock at wolfpackhustle dot com. we have a few different sizes available. No ankle monitor because it doesn’t match her SHOES…? Cut her damn FEET off, then….Put the monitor above her KNEE.